China’s cities are drowning in bicycles. Dozens of “dockless” bike-sharing startups have emerged in the past few years, offering apps where riders can locate bicycles, unlock them and leave them wherever their ride ends. 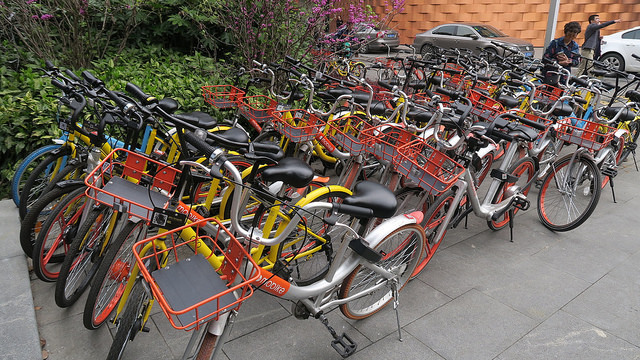 The result in some Chinese cities has been more than a million bicycles piling up in public spaces, blocking entrances to buildings and public transit stops, and obstructing sidewalks. Not only is the situation disorderly, it’s dangerous: Discarded bikes can block pedestrians’ paths, causing them to trip or forcing them to walk in the road. But the chaos may be coming to an end: New regulations aim to restore order to the city’s streets while still allowing bike-shares to thrive. In May 2017, China’s national-level Ministry of Transportation drafted the first country-wide framework for regulating dockless bike-sharing, issuing a formal regulation in August. Since then, nearly 30 Chinese cities have passed regulations to guide bike-sharing’s production, operation and maintenance, adhering to the national guidelines. The regulations also protect consumers financially. The city appointed an independent financial institute to oversee bike users’ deposits, assuring that they’ll receive their money back if a bike-share operator goes bankrupt. Shanghai’s regulations show a great level of versatility and detail in terms of management of cycling safety, fleet control, parking, maintenance and data sharing. Other cities are now following suit around the globe, such as Seattle. Both Shanghai’s and Seattle’s regulations set a cap for the number of bikes allowed in the city. Seattle also required its fleet control to be carried out in phases, requiring operators to introduce no more than 500 bikes in their first month of operation, and no more than 1,000 by the second month. From the third month onwards, if an operator satisfies all of the city’s regulations, it can introduce more than 2,000 bikes, so long as there are fewer than 340 bikes in 1,000 square miles. In terms of bike parking, the Seattle Department of Transport also suggested that dockless bikes should only be parked on the edges of the sidewalk or on a bicycle rack so as not to obstruct pedestrians. Bike parking is forbidden in certain areas, including narrow areas on the outer side of sidewalks, corners and more. If a dockless bike hasn’t moved for seven days or the bike is not parked standing upright, city workers will remove it and only return it to operators once they’ve paid a fine. Everyone benefits if bike-sharing thrives. Bikes cost-effectively make cities more accessible for citizens, and can complement more traditional mass transport. They’re also vitally important in the global battle against climate change: About 70 percent of the world’s greenhouse gas emissions come from cities. Bike-sharing’s evolution will be more orderly and effective with a balanced regulatory framework. Only through proactive regulation can urban bike-sharing systems flourish without jeopardizing public wellness. EDITOR'S NOTE, 1/18/18: A previous version of this blog post stated that Seattle's bike-sharing regulations limit operators to no more than 130 bikes in 1,000 square miles. It is actually 340 bikes per 1,000 square miles. We regret the error.